It’s not the thought that counts. It’s the hug, the squeezed hand, the warm smile, sharing a cup of coffee, dropping by, saying hello, listening. It’s the card from a friend with a special note, calling to talk about things more important than the weather. It’s sitting with a family member through a tough time, standing up for someone in their proudest moment. Sometimes it’s just showing up and being fully present. This entry was posted in Culture and tagged culture, human relations on December 17, 2018 by Tom Foster. For many things in an organization, we document our methods and processes in writing, call them standard operating procedures. SOPs codify the required behaviors in the work that we do together. Culture is different, because it is mostly an unwritten set of rules that governs our behavior in the work that we do together. It is always a good idea to have alignment between your standard operating procedures (written), and your culture (unwritten). Because, wherever there is a discrepancy, culture always wins. This entry was posted in Culture and tagged culture, reality, standard operating procedures on October 3, 2018 by Tom Foster. The situation may look like a personality conflict, but the symptom leads us astray. When two people are at cross-purposes, locked in disagreement, it is because we, as managers, created the conditions for the behavior we see. Still looks like a personality conflict? If you are in a place of worship, a temple, synagogue, sanctuary, are you likely to be loud and boisterous or quiet and reflective? If you are at a sporting event and your team just scored a goal, are you likely to be loud and boisterous or quiet and reflective? Your behavior in those two circumstances is quite different, but did your personality change? Your behavior changed because the context changed. Change the context, behavior follows. Structure is the way we define the working relationships between people in our organization. Culture is that unwritten set of rules that governs our required behaviors in the work that we do together. Structure is culture. Culture is context. Change the context, behavior follows. Be careful how you define the working relationships in your organization. Structure creates the conditions for things that look like personality conflicts. Change the context, behavior follows, first taught to me by Gustavo Grodnitzky. This entry was posted in Culture and tagged behavior, culture, structure on August 8, 2018 by Tom Foster. Sometimes people on your team don’t fit. Culture is that unwritten set of rules that governs our required behavior in the work that we do together. Some people don’t fit. It doesn’t make them a bad person, they just don’t fit. Some companies hire for culture, assuming the company can train the technical stuff. Some companies require the technical stuff assuming the candidate can adapt to the culture. 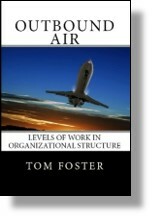 Organizational structure is the way we define the working relationships between each other. Organizational structure is culture. Based on your product or service, your business model, what is the relationship your customer wants with your organization? The Discipline of Market Leaders documents three types of relationships (why customers buy from us). Your customer relationship platform drives everything else, specifically your structure. It is the basis of your business model. When your organization structure (your unwritten set of rules) gets out of sync with your customer relationship, you will experience pain. This entry was posted in Organization Structure and tagged business model, culture, organizational structure on May 11, 2018 by Tom Foster. This is not a simple question. What is company culture? And what is my accountability, as a manager, related to culture? Some time ago, writing a role description, I added Culture as a Key Result Area. What is the accountability of a manager in the Key Result Area of Company Culture? Company culture is that unwritten set of rules that governs our required behavior in the work that we do together. It is unwritten in contrast to our written set of rules, policies, procedures. Culture is often more powerful than any policy we may write or attempt to officially enforce. Sometimes, culture even works against our stated policy. What is the source of culture, where does it start? How is culture visible, how do we see it? How is culture tested? How is culture institutionalized, reinforced and perpetuated? These are the four steps in the Culture Cycle. 1. The source of culture is the way we see the world. It includes our beliefs, bias, our experience, our interpretation of our experience. Culture is the story we carry into our experience that provides the lens, the frame, the tint, the brightness or darkness of that story. 2. Culture, the way we see the world drives our behavior. We cannot see the bias in others. We cannot see their interpretations of the world. We cannot see the story people carry in their minds, but, we can see behavior. Culture drives behavior. Behavior makes culture visible. 3. Behavior, driven by culture, is constantly tested against the reality of consequences. For better or worse, behaviors driven by culture are proven valid, or not. Our culture stands for what we tolerate. This is counter to the notion of the lofty intentions of honesty and integrity. Our culture stands for the behaviors we tolerate related to the lofty intentions. 4. Behaviors that survive, for better or worse, are institutionalized in our rituals and customs. This ranges from the peer lunch on a team member’s first day at work to the hazing in a fraternity house. But, it all starts with the way we see the world. There is accountability, for a manager, in each of the four steps in the culture cycle. Beliefs and assumptions. Every manager must be able to verbalize and discuss the beliefs held by the organization. This discussion may be in the form of stories, or observations of specific behaviors that support those beliefs. If the belief is that all team members must return home each day with all their fingers and toes, the manager must be able to tell stories that illustrate safe and unsafe work practices and the consequence of each. Connected behaviors. Every manager must be able to identify behaviors that support the beliefs of the organization (positive behavior) and behaviors inconsistent with those beliefs (negative behavior). Every manager must be able to verbalize and coach those behaviors, acknowledging positive behavior and intervening negative behavior. If the belief is that every team member must return home each day with all their fingers and toes, the manager must be able to verbalize safe work practices and coach corrective behavior. Testing against reality. Every manager must be able to reconcile connected behaviors with the consequences of reality. There must be consistency between positive behaviors and negative behaviors with what really happens as a result. If the behavior related to safety is to wear protective gear (safety glasses and gloves), then the manager may not allow unsafe work practices just because it is more convenient. Convenience often wins. We stand for what we tolerate. Customs and rituals. Every manager must execute in the customs and rituals that support the beliefs of the organization. If it is the ritual to reinforce behaviors related to safety, the manager cannot cancel the morning safety meeting because she is too busy. This entry was posted in Culture and tagged accountability, culture on November 27, 2017 by Tom Foster.